A concrete overlay with a stamped timber plank pattern and a faux brick border interfaces seamlessly with an existing brick patio. “The biggest challenge was to line up all the seams of the planks. We wanted a continuous plank seam from one end of the patio to the other,” says Espinoza. To create the brick pattern, his crew used ¼-inch wood trim pieces applied to the surface with hot glue. 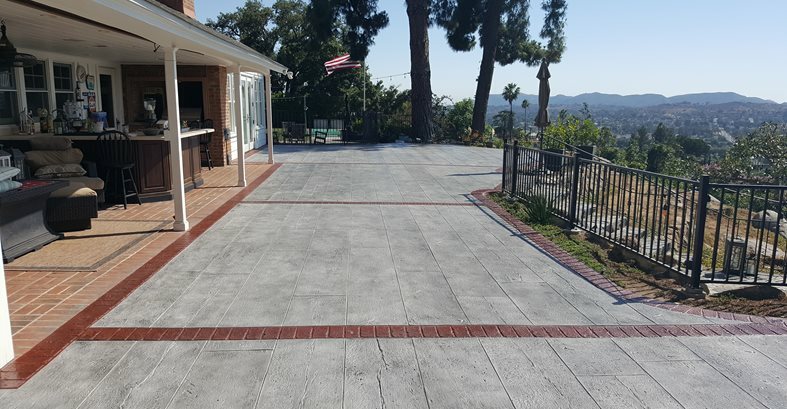 How do you put a fresh finish on an existing concrete patio, yet make it look worn and weathered? 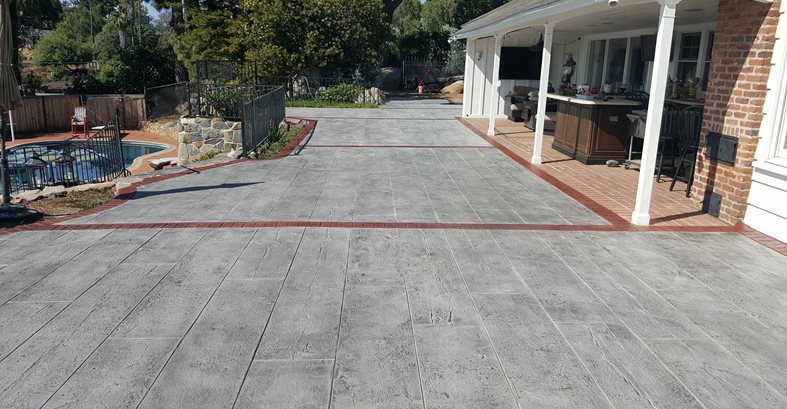 For these homeowners in Escondido, Calif., the solution was a stamped concrete overlay replicating weathered wood and brick, resulting in a new surface with a naturally distressed look. Most of the project involved surface preparation of the existing concrete patio to get it ready for the overlay, including lightly grinding and etching the concrete and filling in cracks with a rapid-cure repair material. After the prep work, Espinoza’s crew started laying out the brick pattern, using ¼-inch wood trim pieces and applying them to the surface with hot glue to form the bricks. After placing the overlay, they removed the form pieces before filling in the rest of the overlay with the stamped plank pattern. “The biggest challenge was to line up all the seams of the planks. We wanted a continuous plank seam from one end of the patio to the other. This was achieved by taking meticulous care when stamping,” says Espinoza. A variety of coloring techniques were used to produce the natural aging effects. “For the wood, we used an integral color (oceanside) and came back the next day to apply two colors of an antiquing color wash in soft gray and midnight gray. For the brick, we used a brick-red integral color along with an antiquing wash in kiln red. We then sealed the overlay with a solvent-based acrylic,” says Espinoza.